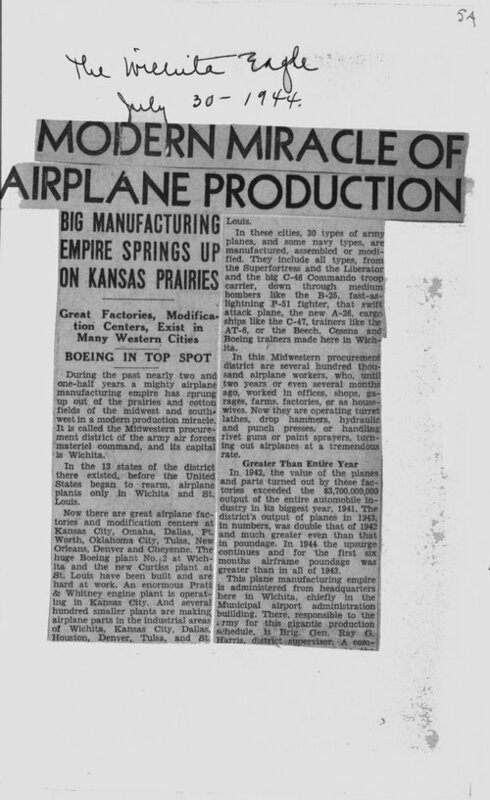 This article from the Wichita Eagle details the rapid growth and success of the aviation industry in Kansas during World War II. With the Boeing Aircraft Company in the top spot, Kansas, and Wichita in particular, served as the center for the expansion of the U.S. airplane production industry during the war. Of course, the enormous amounts of airplanes being produced required careful oversight which was provided by Brigadier General Ray G. Harris, head of the U.S. Army Midwest Procurement Center. This article can be combined with other material on the rapid growth of the aviation industry in Kansas during World War II to give students an idea of the scale and significance of the endeavor.